PORTLAND, Me. – July 21, 2009 – Expert dog trainer and creator of Natural Dog Blog (www.naturaldogblog.com) Neil Sattin today released Natural Dog Training: The Fundamentals, a new two-DVD set that teaches the basics of Natural Dog Training. The first and only DVDs to teach Natural Dog Training, the two-disc set is an ideal way for the average dog to learn basic and advanced obedience at home, without a professional trainer, and gain the benefits of a deeper emotional connection with their human. The DVDs cover introductory techniques as well as address more challenging situations like dog aggression, anxiety, fearfulness, and hyperactivity. “Natural Dog Training taps into our dogs’ deepest instincts and lets us see the world through their eyes, or, more accurately, feel the world through their hearts,” said Sattin. 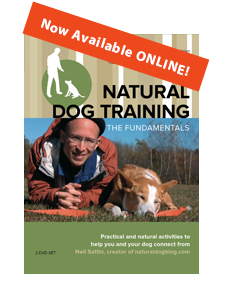 Natural Dog Training: The Fundamentals is available at www.naturaldogblog.com and Amazon.com. The two-disc set sells for $65. For an online preview “trailer” please see https://www.naturaldogblog.com/media. Neil Sattin is one of the nation’s leading experts in Natural Dog Training. He writes the Natural Dog Training Blog (www.naturaldogblog.com), the web’s most comprehensive resource on the art and science of Natural Dog Training, visited by thousands of dog lovers per month who use the technique personally and professionally. Natural Dog Training uses a dog’s emotional awareness of the world and their prey drive to develop a deeper emotional connection between dogs and their human companions, teach obedience, and solve problems like dog aggression, anxiety, fearfulness, and hyperactivity. Sattin began studying Natural Dog Training after being told by a prominent trainer that his beloved rescue dog Nola should be euthanized because of her aggression, and after embarking on a career of private training and group workshops, and designing and producing an ultra-long, ultra-durable, high-visibility training lead, he produced the Natural Dog Training series of DVDs to help dog owners learn the techniques at home, without a professional. For more information please see www.naturaldogblog.com. Editor’s Note: For clips or b-roll from Natural Dog Training:The Fundamentals, or for a review copy, please contact Gary Smith, Evolotus PR, gary@evolotuspr.com, or (818) 783-0569.